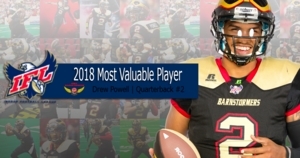 DES MOINES - Iowa Barnstormers quarterback Drew Powell was named the Indoor Football League’s 2018 Most Valuable Player, the League announced. Powell (6'3, 220, Livingstone College) has been named the 2018 IFL Most Valuable Player. In his first season at quarterback with the Iowa Barnstormers, Powell led the team to their first ever United Bowl appearance, also marking the team’s first Championship appearance since 1997. Powell finished the regular season completing 154 of 226 passes for 1,604 yards and 34 touchdowns against just four interceptions. Powell also proved himself to be a run-game threat, rushing for 945 yarrds and 23 touchdowns. Powell’s 945 single season rushing yards were second most in IFL history. Missing two games during the season due to a stint in the CFL didn’t slow Powell down. Powell earned IFL honors as Offensive Player of the Week three times during the season in weeks 1, 13, and 14. Following the season, Powell was named First Team All-IFL QB.